Gratitude. We hear this word everywhere. We hear this phrase: Live in gratitude. What does that mean and how can it relate to our individual health, wellness, and beauty? 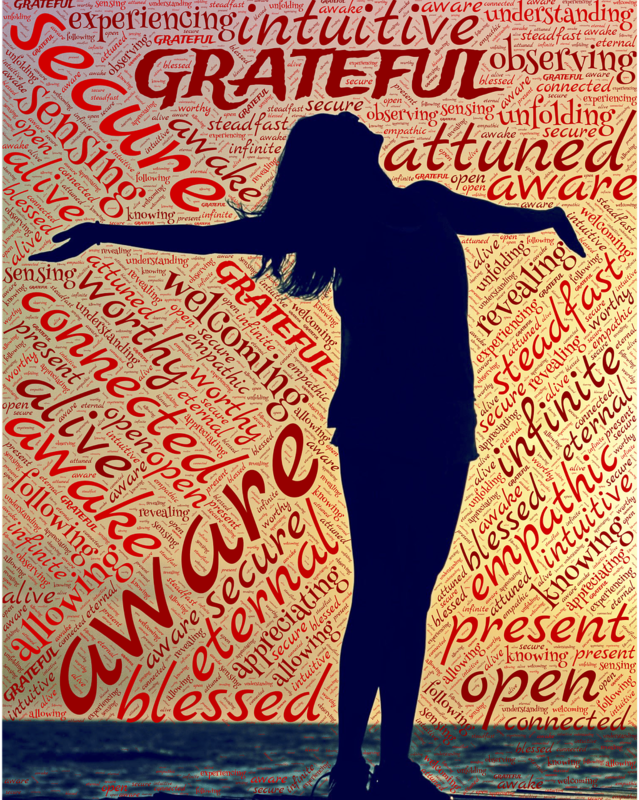 Being grateful is more than morning affirmations said briefly and sometimes rote. Being truly grateful is a state of being. It is an attitude and an identity. It permeates actions, thoughts, words and, intentions. The first realization of being grateful is love. If you are giving or receiving love, you are in a moment of gratitude. Someone is truly grateful for your existence when they show you they love you. The best place to start loving is ourselves. We must foster the greatest appreciation and gratitude for ourselves. When we remove judgments on ourselves we are free to love ourselves in both a broad and specific manner. Loving ourselves becomes forgiving ourselves. We are all flawed beings. None of us can hold up a medal of perfection. So, how can we hold ourselves accountable while forgiving ourselves? Love. Showering ourselves with love is a beautiful goal. But know that there may be some resistance. There may even be a mountain of resistance. This is a journey of the soul. It takes time, nurturing and compassion toward ourselves. Our inner voice is our constant. How do we speak to ourselves? What do we say when seeing our reflection? How do we express our inner voice after a disappointment or mistake? Studies show a direct correlation between self-esteem and a high quality of life. This includes health and overall wellbeing. When choosing to examine where we stand with our relationship to ourselves, there are many positive outcomes to look forward to. When loving ourselves starts with how we communicate with ourselves, the next step is inevitably how we treat ourselves. How we care for our emotional and physical wellbeing are intrinsically related. Nourishing our bodies has a direct link to how we feel physically. When nutrition is a priority we make a point of choosing foods that are going to provide essential nutrients that help build and sustain our health. In this time of mass production and consumption of food, being discerning is an act of love, not only to our health but our entire wellbeing. Overconsumption of antibiotics and pesticides in our food have been found to have negative effects on both mental and physical health. Taking the time to source the cleanest possible food for yourself can be the start of your physical self-love. Food that has been ethically processed and prepared is also a signal of love toward ourselves as well as our environment. There is a distinct satisfaction when consistently eating densely nutrient-rich foods that are prepared with our bodies highest needs in mind. It is a feeling one must experience to truly appreciate. So now we are speaking beautiful words of encouragement and love. We are nourishing ourselves with rich gorgeous foods that delight us with their bright colors and wonderful flavors. How do we go about really feeling fantastic? Pampering our soul and body with lovely acts of gratitude. When feeling under the weather, we can make a choice. We can push through and become run down and possibly sick. Or, we can rest, comfort, and heal. Being truly grateful for our resilient good health means doing what our body needs to stay vibrant. Respecting our physical needs is loving ourselves and living in gratitude. This pampering naturally leads to giving in to our bodies other needs. Taking care of our outer physical health is a sign of love as well. Making sure our health is apparent in the care of our skin, hair, nails, teeth etc. We want to embrace our entire selves without guilt or shame. Embracing our unique beauty is a lovely gesture of gratitude for who we are. When we walk through life and can see ourselves in others, it becomes easier and natural to show that same compassion to others that we have shown ourselves. We are grateful for what we have and what we contribute to our world. We are grateful for the things we love. We remove judgments that previously blocked that appreciation. When we begin loving ourselves and honoring our true self with gratitude for who we are, a beautiful pattern emerges. We begin to see life around us through a renewed perspective of love.